New NAPLAN results for 2017 show continuing large achievement gaps between disadvantaged students and those from highly educated families. The gaps have increased between students from highly and lowly educated families since 2008, but have narrowed between high education status students and Indigenous students. The achievement gaps between Year 5 students from high and low educated parents in 2017 amount to over 2½ years of learning in reading and about two years or less in writing and numeracy [Chart 1]. In Year 9, the gaps are about four years in reading and numeracy and 4½ years in writing [Chart 2]. These are massive gaps in learning. In Year 5, one year of learning is equivalent to about 35-40 points on the NAPLAN scale and in Year 9 one year of learning is equivalent to about 20 points. The gaps have increased in reading and numeracy since 2008 and since 2011 in writing (writing was assessed differently prior to 2011). The reading gap between students from high and low educated parents in Year 5 increased by 19 points on the NAPLAN scale - a 25% increase. This increase is equivalent to about six months of learning. The numeracy gap increased 14% and the writing gap by 6%, although the writing increase is over a shorter period. 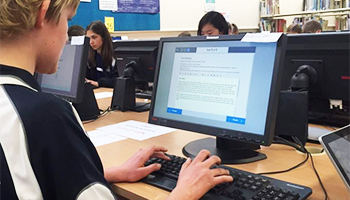 In Year 9, the reading gap increased by 13 points, which is equivalent to about six months of learning. Smaller increases occurred in writing and numeracy. There are very large achievement gaps between students from highly educated parents and Indigenous students. In Year 5, they amount to about three years of learning in reading and about 2½ years or more in writing and numeracy [Chart 1]. In Year 9, the reading gap is about 5 years of learning, 6 years in writing and 4½ years in numeracy [Chart 2]. While the gaps between students from highly educated parents and Indigenous students are very large, they have narrowed since 2008 (and 2011 for writing). There have been only small reductions of 8 and 7 points in Year 5 reading and numeracy and a larger reduction of 14 points in writing. In Year 9, there was a small reduction of 5 points in reading, little change in writing and a more significant reduction of 17 points in numeracy, the latter amounting to nearly a year of learning. The gaps in Year 5 reading, writing and numeracy results between students from remote areas (not including very remote areas) and students from highly educated parents are equivalent to about two years of learning [Chart1]. Year 9 remote area students are about 3½ years in learning behind students from highly educated families and about 4½ years in writing [Chart 2]. Mostly, there were only small changes in achievement gaps for remote area students. There was a small increase in the gap in Year 5 reading, a small decline in writing and no change in numeracy. In Year 9, there was little change in the reading and writing gaps and a decline of 13 points in numeracy. Overall, it appears that the funding and other resources devoted to improving outcomes for Indigenous students is having some effect in primary school but not much in secondary school. Average results in Year 5 reading and numeracy have improved significantly and led to a reduction in the achievement gaps. There was little change in Year 5 writing results for Indigenous students and the significant reduction in this achievement gap was due to a decline in the average writing score for students from highly educated families. However, despite the reduction in the gaps, they remain very large and it will require major ongoing efforts by governments to reduce them further. Average Year 9 reading results for Indigenous students are largely unchanged since 2008 and have declined in writing. However, they have improved significantly in numeracy to the extent of nearly one year of learning. This has led to a significant decline in this achievement gap, even though the gap is still very large. Average results for students from low income families have been stagnant or declining. Year 5 reading and numeracy results are largely unchanged since 2008 while writing has declined significantly since 2011. Year 9 reading has declined by over six months learning since 2008 while there was little change in numeracy. Year 9 writing declined by over a year of learning. The stagnant or declining results for students from low educated families and the increasing gaps between them and students from high educated families reflect the longstanding failure of governments to adequately support these students. Funding increases over the past decade have been badly misdirected. They have strongly favoured private schools which enrol less than 20% of low SES students. Total government (C/W & State) funding per student adjusted for inflation for Catholic and Independent schools increased by 13% and 15% respectively between 2009-2015 (latest year available). In contrast, total government funding for public schools, which enrol over 80% of disadvantaged students, was cut by 3% because of a cut in state government funding by 7%. There can be little wonder then why we have failed to reduce the achievement gaps between advantaged and disadvantaged students. There is no prospect for change under Gonski 2.0 - it delivers more funding increases for private schools while leaving the bulk of funding of public schools and disadvantaged students dependent on the states. Yet, the states have cut funding per student in public schools since 2009. They have failed public schools and disadvantaged students. Despite this, Gonski 2.0 puts an absolute limit on funding public schools to only 20% of their Schooling Resource Standard. What we need is a nationally integrated funding model which directs funding increases to those most in need as Gonski originally recommended. The Turnbull Government has washed its hands of a truly national approach and reverted to the traditional role of Coalition governments giving priority to private schools. There will be little change in the massive achievement gaps between rich and poor until we have a genuine national funding model which increases funding for public schools and disadvantaged students.